You now know about git workflows. Git has some other concepts like amending commits, and rebasing which are also useful. But Git workflow is pretty important for big projects to be successful. For small projects this workflow can seem to be like an overhead. So other alternatives can be used in small projects. Generally I disagree that the reviewer should solve conflicts. I had to do that and it's the hardest thing on planet when you have not written the actual code. Conflicts happen when two or more people work in the same sphere. They should be able to handle it. The reviewer should only review the code that works. Ideal approach is the developers resolve the conflict themselves :). 100% agree. Why should the reviewer be tasked with resolving the conflicts? I'd not say that GitFlow has real advantages for me, the thing is you might end up with a lot of branch merging which is a real chore and always delays the speed of the development. In practice there is lot more merges b/w branches back and forth if one follow a git flow based approach. You might consider trunk based development as an alternative. But the trunk based development doesn't allow me to manage what goes to release, you take what's in trunk branch and create a release from it (few of our product managers just fainted), you never know if your trunk is stable etc. Merging between branches with git-flow is a chore if you let it be a chore (there are few git-flow scripts/tools that help with it). if you have a hotfixes ( urgent bugs ) how do you deal with them in terms of SCM flow ... ? Maybe 10 to 20 commits a day max by all devs combined :D.
Varies. 4 to 8 depending on the requirement. There are situations where the codebase is shared between multiple projects and teams. That's one of the reason this approach worked well till now. Ok. You did not say here. Do you propagate hotfix commits back to dev and release branches ? 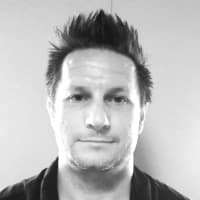 Do you make production release immediately once new release branch is created? Do you continue to merge from dev to release after a new release branch is created? 1) The hotfix branches are cut from master branch and merged back to master and then to develop branch. 2) You do production release when the hotfix branch from 1) is merged back to master. 3) You don't merge develop branch once you cut release branch from it. This release branch is then just for fixes devs create against it directly or with PRs. Release branch in git-flow is used to QA testing and resolving bugs they find to stabilize that release. When it's signed off then it's merged to master and followed by merge to develop. In trunk based development there is one main branch ( I am not talking here about short leaving features branches and release / hotfix branches that also exist, anyway ... ) which radically simplifies and increasers the speed of development cycle. And trunk branch is always stable, you can read more about this on the mentioned site or other resources. Yeah TBD has some tradeoffs but they are incomparable with disadvantages introduced by gitflow. Sorry, but what is hard on following commands to create a release branch and then close it? Sorry again, but people who do write off git-flow because they think it's complicated, they simply don't understand its beauty, sophistication, and advantages. And when you combine it with GitHub Flow (Fork&Pull Request), it can't simply be beaten. And believe me, with TBD you get your trunk/master messy and unstable if anybody can merge there, I tried implementing that many times. And I ask you again: How do you manage what goes to release when everybody is merging to one branch whatever and whenever they decide? Well, the shortcuts you have here is just smallest and easiest part of the workflow, the hardest part is merge branches not creating them. In classical git flow you have 5 types of branches you have to merge and create in specific order and in specific times. If you don't follow the rules strictly you end up with the mess. While it's probably easy to follow gitflow with small projects and low frequency of releases, it is way too harder to keep this approach with frequent releases and large code base. This is why companies with large code base and frequent releases like Google practice kinda TDB methodologies ( with variations ) instead of gitflow. Actually you do, but not about technical aspects of merging, but about WHAT you merge, even the fact you have no conflicts or resolved ones does not mean the resulted code is right. Don't get me wrong I am not against merging, but merging is still hard ( not technically but logically ), TBD tries to avoid a lot of merging while gitflow upholds. The same as with gitflow. At some point you cut off from main branch and create release one. Pretty good. I have one question about a project with multiple version alive (like apache 2.0.x, 2.2.x and 2.4.x) that are developed concurrently. I have the master branch that holds the latest stable version. I have RC branches (or staging) for debug and delivery. I have hot-fix branch that by-pass directly from master. What strategy should be implemented in a case like Apache HTTPd server, where 3 main versions are maintained? Should we use 3 different repositories, or should we have three master branch (master20, master22 and master24 for exemple?). Is there other options? Never worked on any project with multiple active versions. I am guessing if the development is concurrent on all the versions, and if the versions have different features then its better to have separate repos for them like angularjs and angular. Well, 3 repos if you don't trust your developers they will create their feature/bugfix branches from correct develop branch, and code lieutenants responsible for accepting PRs or merging from and to correct branches. 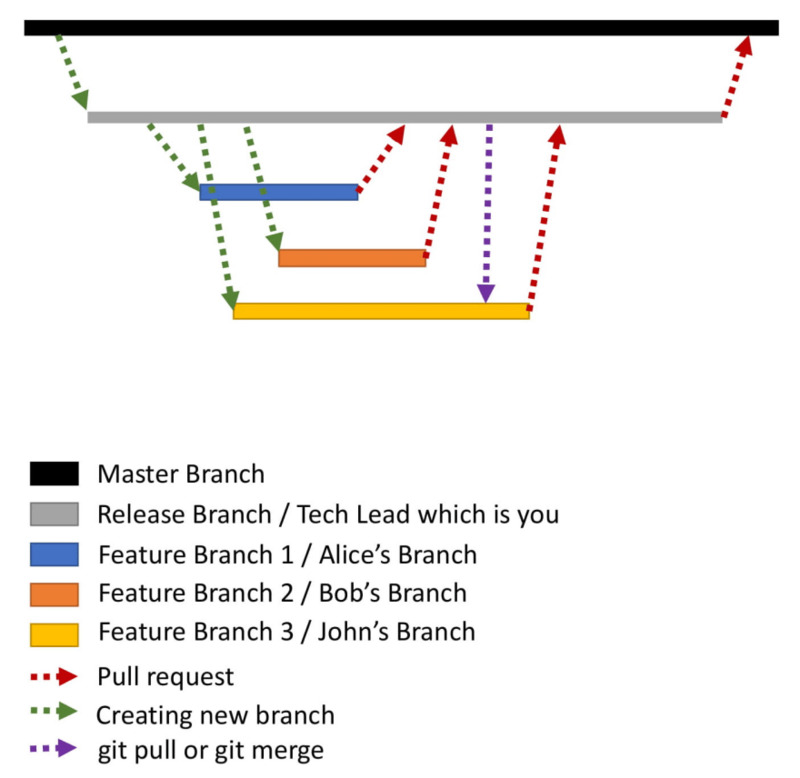 Otherwise with git-flow and if you develop new features to all those releases, you will need to have 6 branches (master2_0 => develop2_0, master2_2 => develop2_2, master2_4 => develop2_4). Actually, if you want develop new "main" version, you will end up with 8 branches, with additional branches like master-next and develop-next, where you develop new features which are going to next main release, like 2.6. If you just maintaining those master2_2 and master2_4 branches for security fixes, you should be OK with just master2_2 and master2_4 without develop2_2 and develop2_4 branches and with classic git-flow hotfix branches. That was basically my concern with one repo, it felt really troublesome for not many advantages. It seems for me that 3 repos are the way to go. The repo is cleaner, less confusing. Sorry, but this "It is the responsibility of the reviewer to resolve these code conflicts and merge the code. In this case, you as the tech lead need to resolve these code conflicts and merge the code." is fundamentally wrong and that's not how Pull Requests work. Before any Pull Request can be merged it has to have resolved any conflict with code in target branch (I believe GitHub wouldn't allow merge before the conflicts are resolved). And that is PR author's, no matter if begginer or senior, responsibility. This has been workflow for Linus, for GitHub and its clones, actually everybody for years. But in enterprise projects, in case the developer is a beginner , it is better if the tech lead resolves the conflicts. Over time with experience the developer would learn how to resolve conflicts. Maybe the right way of putting it in the article would be "The Tech lead can resolve the conflicts in case the deadlines are tight. But best practise is to ensure beginner devs take the help of someone to resolve conflicts so that they learn the process as well"
I have a question, what is the pros and cons of using forks (with branches) instead of new branches in the "upstream" repository? Generally in open source projects you would fork the repo, make your changes and then raise a pull request to the original repo. The reason for this is that you would not have write access to the original open source repo. Unless you have write ( collaborator ) access you cannot create branches in the original repo. What I have explained in this article in a branching strategy which can be used provided you have write access to the repo :). This is easily applicable to enterprise projects. Yes, I know that, on the company I'm working I always recommend to fork the project and then work on the forked one, the devs don't have write access to the original repo, I like to keep clean the original repo and only have the branches I (or the Technical lead) want to keep. Extra steps to update your local code. You can't prevent the dev work on master or developer branch. Easy to brake the master/developer branch. What do you think? you add more pros and cons? But I did come across branch level permissions as well. So one thing which can be done is only the tech lead and some senior devs have write access to the master and the release branch. What do you think about branch level permissions instead of forking in enterprise projects? 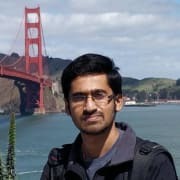 Agreed with you, I'm currently thinking on what is the best approach using fork or branch access on upstream. is it a good approach or not? I did exactly what you have mentioned. actually i think there may be a issue..
just to get things a bit easier to work with..
hv any ideas about it? Rebase is generally used to update the code in local with the latest code in remote. Using Rebase in the remote can create issues since it overwrites history. I guess one option is to handle it in the code itself rather than trying it with git. You can have a config to say which features to enable and disable. I think having a config like that makes it easier than handling it with git. What is your take on this? using config file is a brilliant idea! why i hvnt thought of this before! One more thing I’d add is make sure the expected git flow is documented. I’ve found that devs will have their own ideas on branching and before you know it you have 3 different naming schemes going for branches. You can explain it once, but they will forget or go back to their way after a long weekend. Great article! Close to the approach I like, but missing aspects some projects need. If you need to have some sort of Freeze where only fixes to a release are made, but you don't want everyone to stop using the shared branch, you need a branch for the Release Candidate itself. Then naming the branches Production, Release_XX, and Development makes it easier for most people to understand the processes. Makes patches to releases easier too - especially if different releases are in the wild. There is another method for developer to resolve conflicts, namely rebase his or her changes on top of the current state of main line of development (with interactive rebase the developer would also be able to clean up history to make for easier review). When doing a pull request from rebased branch, it should be able to be merged cleanly. Thanks for this outstanding article. Actually, in my current company we're implementing Git workflow and it is a good material to my coworkers. I'd caution against using / in your branch names. It can cause conflicts with existing files and branches. This was a very clear description of git workflow, thanks! Where is a branch bugfix? I was evaluating whether to add bugfix in this article or to have a separate article only for that. Thought of writing a separate article for bug fix since I wanted to cover some other things as well along with that. 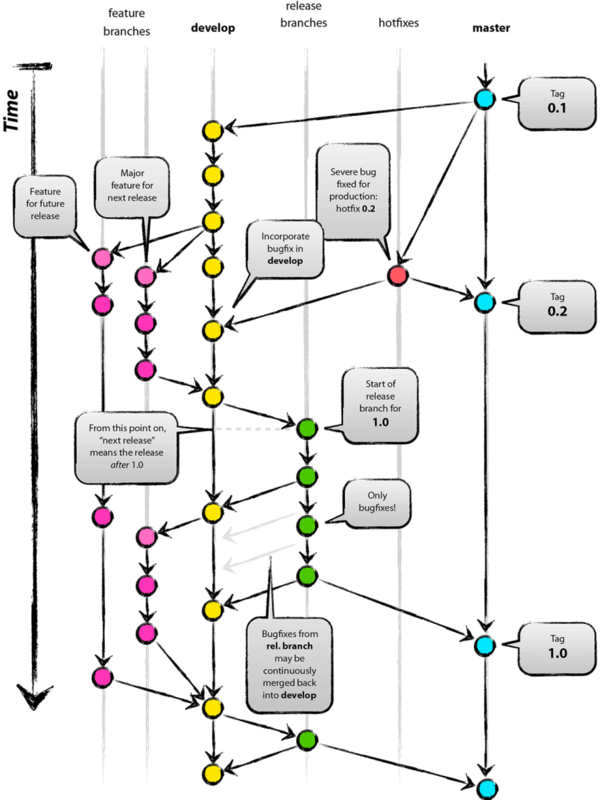 I think this is the best and easy to read explication of Git Workflows I read. Great post for beginners in Git like me.